May 5, 2013  The Solar Impulse, an airplane traveling across the United States using only solar power, is in Phoenix today, after reaching Arizona from California Saturday. It took the plane about 20 hours to travel from Mountain View, Calif., near San Francisco. 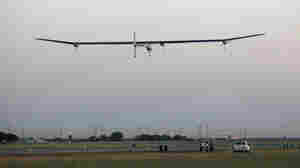 Huge Solar Plane Begins Slow Flight Across The U.S.
May 3, 2013  The ultimate goal is to fly a solar-powered plane around the globe. 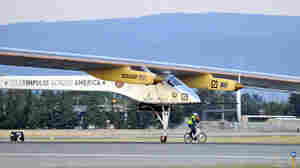 In the U.S., Solar Impulse is expected to finish its journey in New York City.